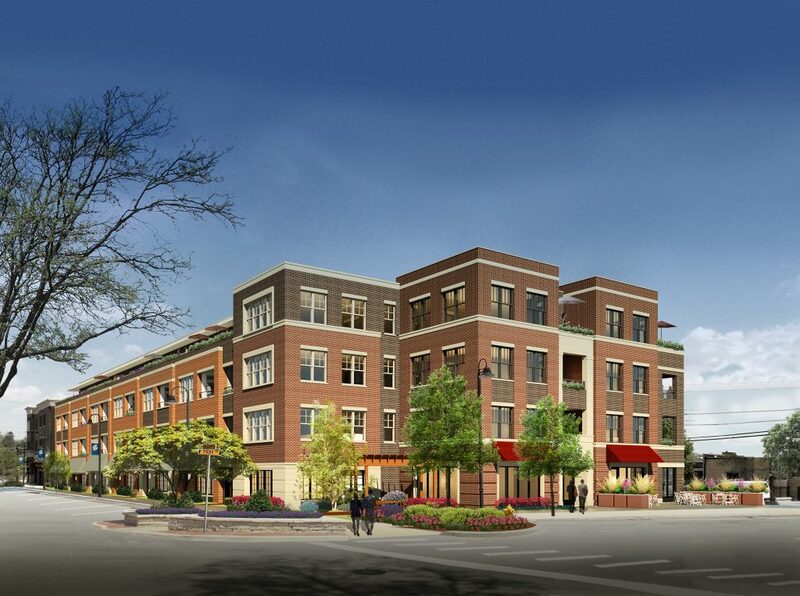 229 Park, currently under construction in downtown Clarendon Hills, Illinois is bringing 35 luxury apartments and parking to the community just steps from the Clarendon Hills Metra station. If you’ve attended any recent Chicago-area real estate events focused on multifamily development, no doubt you’ve heard panelists say “follow the train lines.” Virtually every community in the Chicago area with commuter rail access now has some sort of transit-oriented development (TOD), and our project list indicates that even more are in the pipeline. 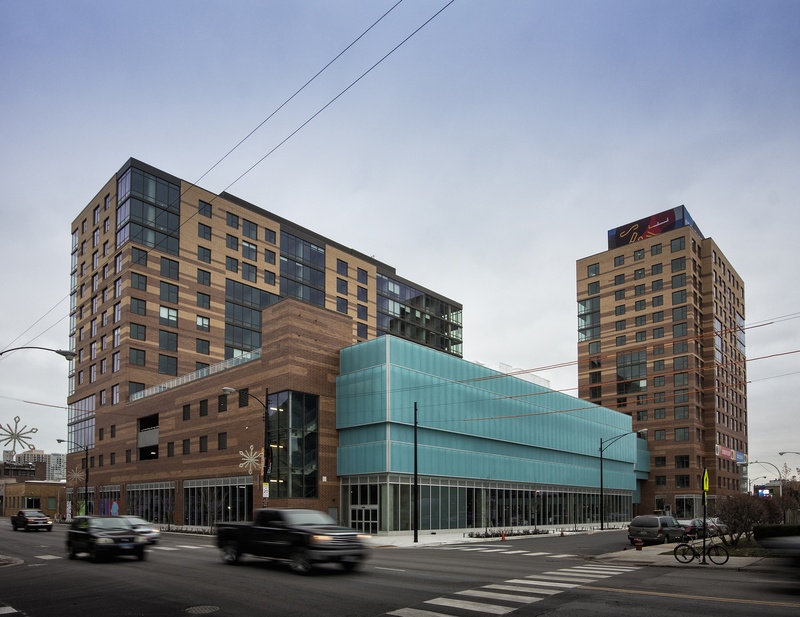 Based on the sheer number of projects, the latest round of TODs in Chicago’s suburbs appears to have surpassed levels seen before the 2008 economic meltdown. Mimicking how development spread along the railroads when the suburbs were first colonized and developed, today’s TODs are sprouting in undeveloped and underdeveloped sites in proximity to nearby rail stations. However, rather than transporting goods and materials, the rails now primarily carry suburban residents to workplaces downtown. New suburban TODs have much in common with developments of the last few decades, but they also reflect an evolution in the suburban way of life and a change in market demand. The current suburban building boom is driven in part by a growing share of millennials seeking a convenient live, work, play lifestyle and the same high-quality housing and resort-style amenities they enjoyed as urban residents. An early view of The Emerson while under construction in downtown Oak Park, Illinois. 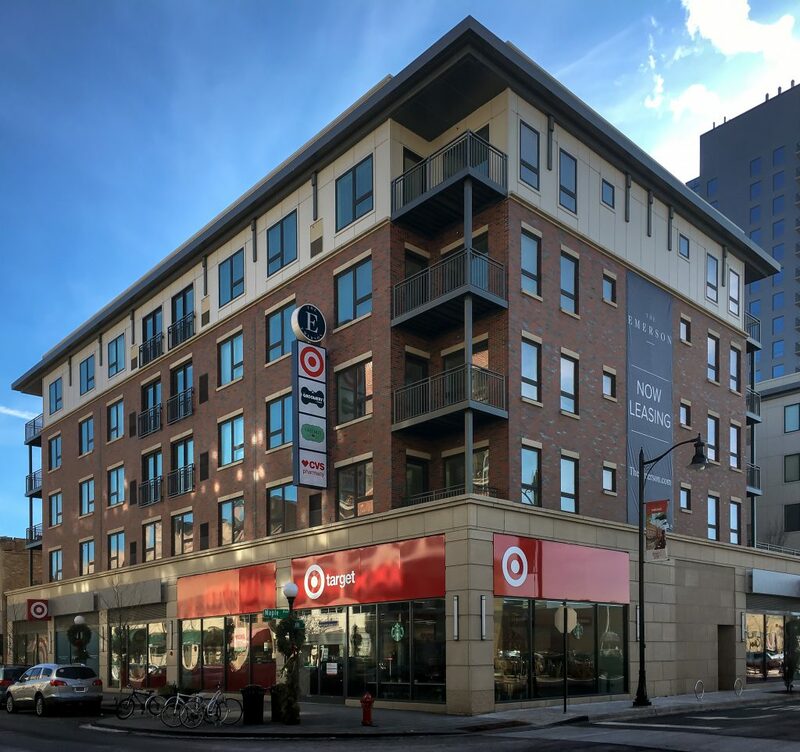 The development brought 270 apartments, retail shops, and a flexible-format Target store to a well-connected corner of Oak Park’s shopping district. Thanks in large part to the educational efforts of non-profit and governmental planning groups like the Metropolitan Planning Council, suburban officials and existing residents have warmed to the benefits that TODs bring to land-locked municipalities. TODs act as catalysts for additional development in suburban central business districts, bringing greater foot traffic for area merchants, increased ridership on suburban commuter trains and tax dollars to village coffers. Building form is also evolving – upward. Rather than three- and four-story buildings, several municipalities, such as Villa Park, will allow for new structures five and seven stories tall. 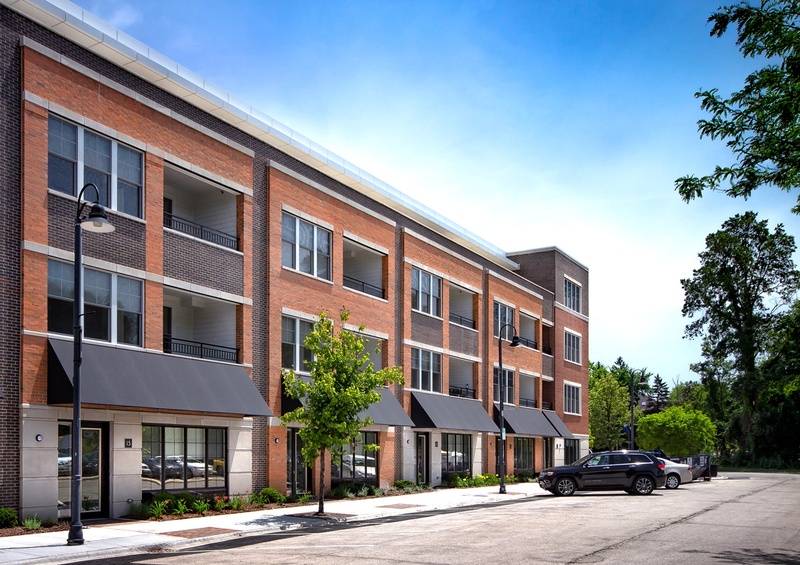 Meanwhile, communities like Evanston and Oak Park that are as much urban as suburban in character are seeing multifamily buildings in the 20-story range. Many of these municipalities adopt new “form-based” zoning codes in place of traditional Euclidian zoning laws, allowing builders to forgo strict floor area ratios or minimum lot size requirements in favor of attractive, compliant designs at an economically-viable density. 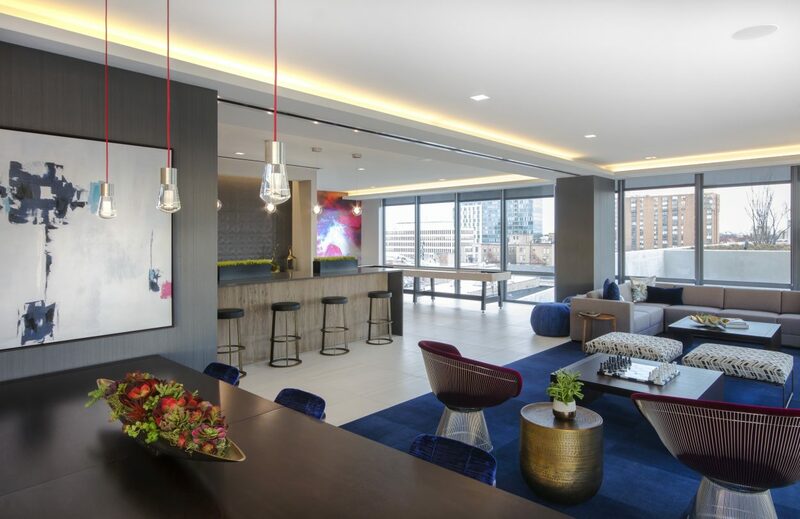 The Emerson’s south building addresses its adjacency to the CTA and Metra lines with a collection of high-rise residences and a substantial parking structure for residents, guests, and the community. Suburban TODs differ from their urban counterparts in other ways, too. Perhaps the most pronounced difference is the larger commercial component of a suburban TOD, largely attributable to the fact that suburban TODs are much more likely to occur in primarily commercial or mixed-use zones, rather than residential areas in the city. And while we see urban TODs reducing and even eliminating on-site parking, the typical suburban lifestyle doesn’t yet support an auto-less existence, even for TODs located in the center of town. 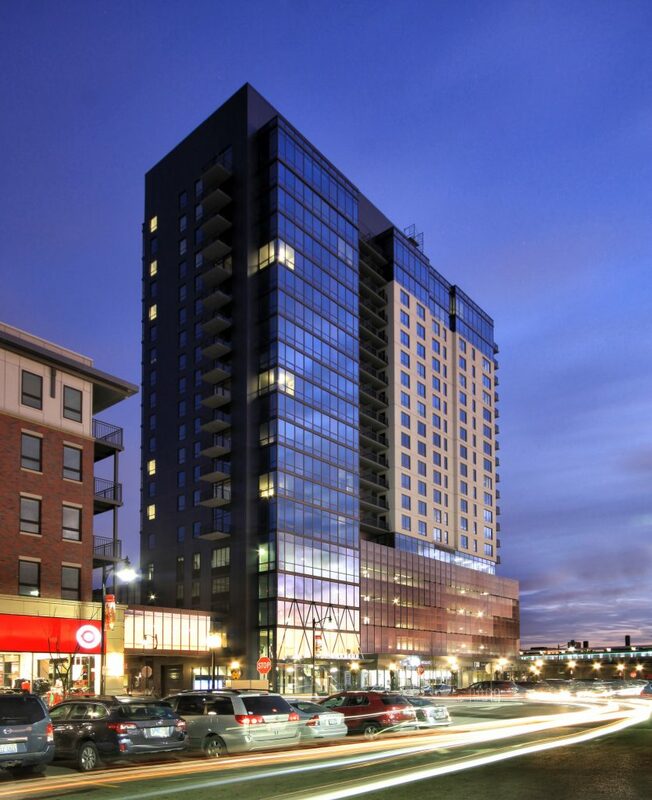 Residential demand for parking is compounded by the suburban TOD’s commercial components that also bring greater parking needs. The additional off-street parking TODs provide also serves to free up the curbside parking favored by small merchants and service providers. 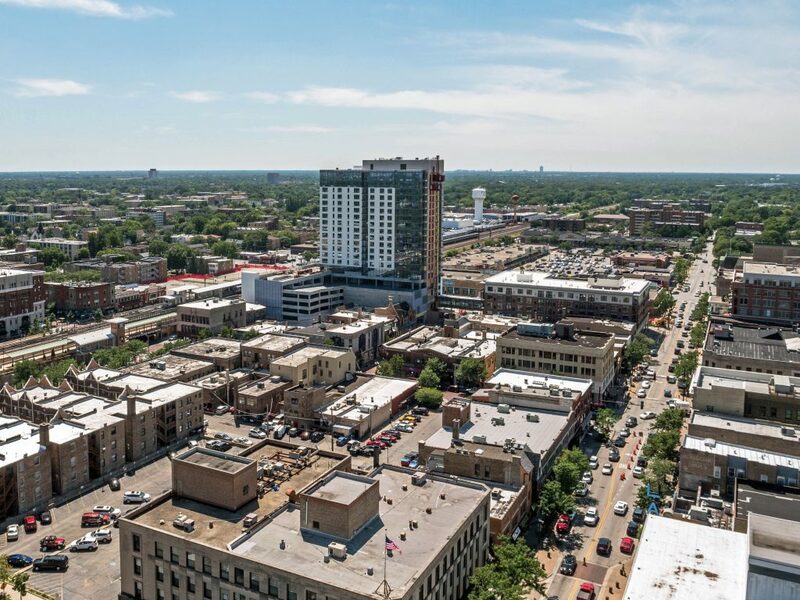 By our count, Oak Park’s downtown district has gained an additional 1,400 parking spaces through the developments currently underway there, including The Emerson, a FitzGerald-designed TOD that will include 428 parking spaces for public, residential and retail uses. The Emerson’s north building blends well with the nearby historic shopping district and includes a new flexible-format Target store. With their built-in residential foot traffic, suburban TODs are also prime venues for restaurant tenants – even more so than urban TODS where there are usually numerous dining options within walking distance of a development. For bigger-box retail spaces in suburban TODs, local and specialized grocers garner the most attention, which can be highly attractive to not only the building’s residents but also a village’s downtown workforce. 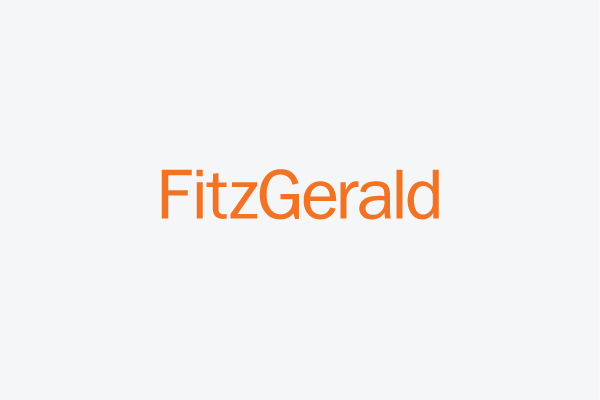 In working with developers to determine what other major shifts lie ahead for suburban TOD, we certainly can’t ignore the trend of corporations like McDonald’s and Kraft-Heinz choosing to move their headquarters to the city. Far-sighted developers may find the next hot spot for suburban TODs to be those challenged corporate parks with Metra access. Where walkable transit doesn’t exist, savvy builders and owners, both commercial and residential, would be wise to consider offering rush hour shuttles to train stations to help solve users’ “last mile” woes. Developers, investors, and residents new and old stand to benefit much in the near future as suburban TODs continue to grow in popularity. With the support of local officials and neighbors, suburban TODs can be a much-needed economic boost and a positive game-changer for many downtowns.